This quick and easy Crab Bisque can be on your table (or in your mouth!) in under 30 minutes! This isn’t a thin Crab Bisque, crab is the star here, with carrots and celery taking second place, and the flavorful broth third. Plus, it’s lower in fat than traditional bisque! 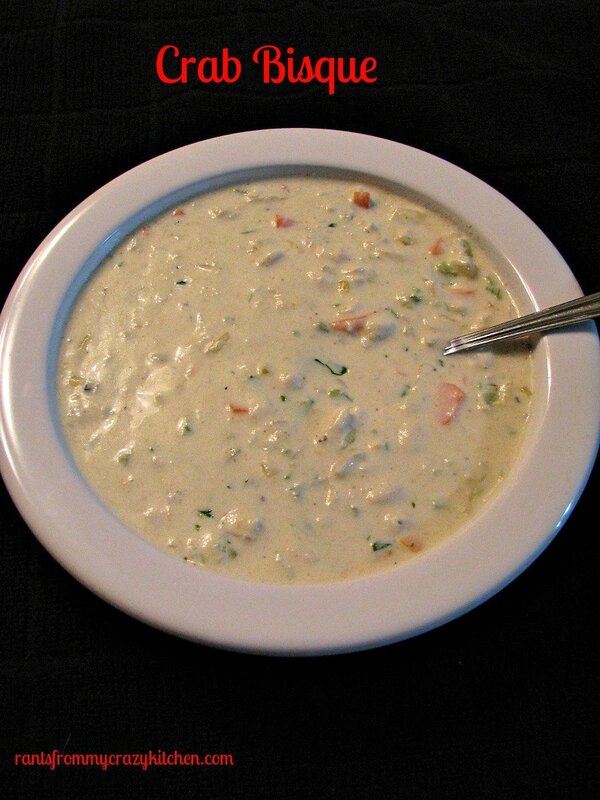 Read on for this creamy and delicious, lower-fat crab soup recipe. Confession, I used canned lump crab in this recipe. Living in Northeast Pennsylvania leaves fresh shellfish pretty much nonexistent in the grocery stores, and I hate to admit it but I’ve never even been in a seafood market…so weird that my husband just called to tell me he is at one, and do I want anything? My answer, “Why have I never been there, and of course, crab cakes!” Ah, Friday’s during Lent (my husband is Catholic, I’m not), delicious seafood dinners! I can find refrigerated crab meat in the local stores, I just happened to buy canned this time. I started this post and hoped to have it done on Friday, but then my daughter got the flu and a double ear infection, doctors on Saturday, distractions on Sunday, Monday I cleaned. So, this is a little late. My real life hasn’t been going the way I would have liked this Winter, thank goodness Spring is coming! 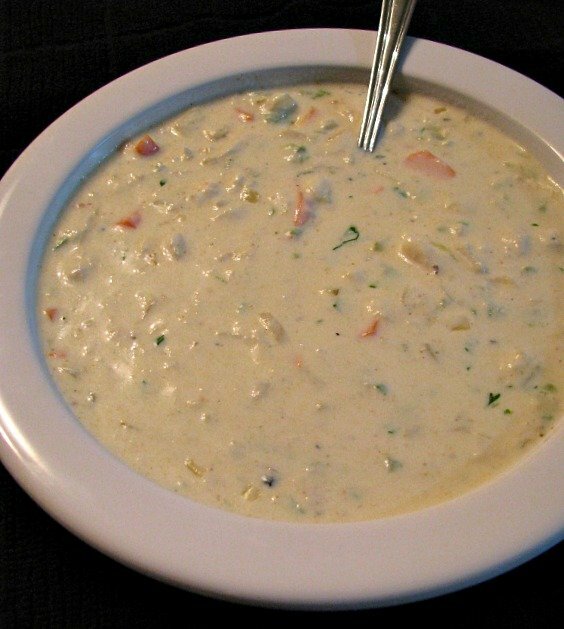 This soup is one of my favorite recipes with crab. It isn’t vegetarian because it uses chicken broth, so it’s not suitable for Lent. I used equal parts reduced-sodium chicken broth and light cream, to keep the fat as low as possible while still creamy and delicious. This quick and easy Crab Bisque can be on your table (or in your mouth!) in under 30 minutes! This isn't a thin Crab Bisque, crab is the star here, with carrots and celery taking second place, and the flavorful broth third. Plus, it's lower in fat than traditional bisque! Melt the butter over medium heat in a large pot. Add the carrots and celery, cook until just softened, 5-7 minutes. Sprinkle in the flour, and cook, stirring, for 1 minute. Pour in the chicken broth, add the garlic, chopped celery leaves, chopped parsley, sherry, and pepper. Bring to a boil and cook for one minute. 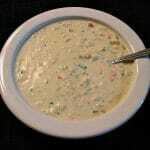 Reduce heat, stir in crab meat and light cream, stir and cook over low heat until heated through. Hi Jan! If you want to make this ahead and freeze it, I would wait until you are reheating it to serve before adding the light cream. Cream (and milk) can separate when frozen. The rest will be fine reheated. I prefer a 50/50 mix of vegetable and seafood stock whether or not its Lent. It’s easy easy to make your own seafood stock by saving your fish heads, carcasses, and bones, along with shrimp and crawfish shells. Start with 1-1/2 gallon of lightly salted water. Add a celery stalk finely chopped including the tops, a carrot finely chopped, 1/2 a small onion, coarsely chopped (leave on the onion skins), and 1 cup dry white wine. Simmer everything for 2 hours over low heat until reduced to about a gallon. Strain the shells, carcasses, bones and veggies through fine cloth to get a clear, very rich stock. It’s so easy! Just be sure to never throw away any seafood scraps, no matter the type. Pop them into a gallon size baggy and keep in the freezer until the bag is full. A full bag of shells, bones, and scraps will make a gallon of rich seafood broth. Great seafood stock recipe! I make chicken stock all the time, but never got around to making homemade seafood stock yet.